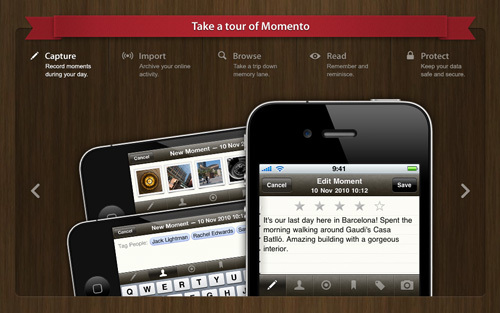 The website for the Momento App has a horizontal-scrolling slideshow that presents new content when the user clicks left and right. 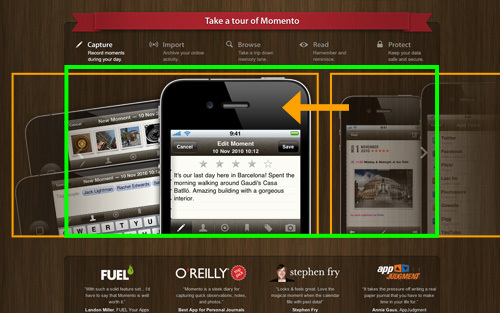 Momento App has its own jQuery plug-in for the slideshow effect. The container tour_pages has a fixed height and width in the CSS. It also has the overflow property set to hidden. You can see in the image below how the five slides are positioned to move inside their containers. A container will clip everything outside of its boundaries because of overflow: hidden. This creates what we can call a window or viewport effect. Showing the clipping frame and hidden elements. The website is intended to sell a product, and this slideshow effect imparts a sense of quality, something that is more exciting than the norm. Interactive content like this works best for promotional content. Will the user understand and expect the relevant action that occurs? If content is hidden, will the user know how to access it? Does the additional user input actually improve the overall experience? Will the website be usable on all devices? Usable and accessible don’t just mean that a device is technically supported by the website. The website should be as easy to use as possible for all audiences—from young to old—and in all environments. The CSS Box Model A friendly introduction to the box model by Chris Coyier. jQuery Tutorials An extensive list of jQuery tutorials. The CSS :hover pseudo-class allows for a style change when the user hovers over an element. Typically used on the <a> element for links, the change can provide visual feedback for the user. While not exactly revolutionary on its own, :hover can be used to great effect. Three phases of the hover transition: default, transition and then hover. Inspecting the HTML doesn’t offer many clues. At a glance, we can see a normal link. This is perfect for semantic markup, but how do we create the transition? We can see in the HTML and CSS that both the a and span are converted to block-level elements to allow for positioning and sizing. They are styled in two states, default and hover (A and C in the image above). By default, the span starts of with an opacity of 0 and at 150 pixels from the top. On hover, the span is fully visible and 130 pixels from the top. The anchor has a simple background color change between A and C.
At this stage, the hover effect jumps from default to the hover state instantly. This works fine for older browsers, but with CSS3 transitions we can create a silky-smooth animation between the two points. Creating hover transitions is as simple as specifying the default and hover states with CSS and then letting the transition property animate any changes between the two. You’ll notice that this example uses the -webkit- vendor-specific property for Safari and Chrome, but transitions are also supported in Opera using the -o- prefix and the new Firefox 4 beta with -moz-. The good news for graceful degradation fans is that older browsers (i.e. Internet Explorer) ignore the transition and apply the style change immediately. This means you’ll rarely find a situation in which using transitions degrades functionality. When using hover, the affected elements don’t always need to sit inside the same container. Love Nonsense makes use of the adjacent sibling selectors to trigger transitions. Simurai demonstrates a combination of transitions and transforms to create a complex experimental toggle button using nothing but CSS and HTML. The :hover is not the only trigger for transitions. Neal Grosskopf’s CSS-only lightbox demonstrates the use of the :target pseudo-class. “CSS Fundamentals: CSS 3 Transitions,” by Dave Sparks. Hover effects work well for links but can be confusing when triggered unexpectedly on other elements. They’re also less accessible on touchscreen devices. Adding interactivity when the user clicks is usually very useful because it provides feedback to the user, and sometimes it just feels more intuitive. Get Satisfaction uses a clever technique to showcase 12 different testimonials. In this example, the company makes use of scalable vector graphics (SVG) to aid with the animation. 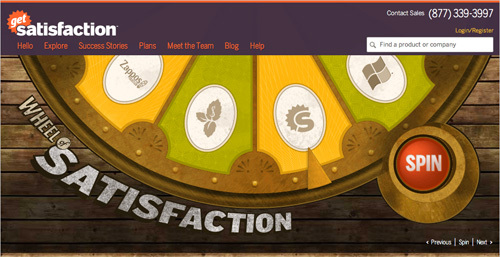 The “Wheel of Satisfaction” animates an SVG image. <image x="91" y="-505" width="820" height="820"
You can see above that the wheel image is contained within an svg element. SVG is an XML-based standard and can be written inline in HTML. SVG is particularly useful because images in SVG can have a transform attribute, allowing for rotation, scaling and skewing (unlike normal HTML img tags). Always consider the pros and cons of any technology. The most logical solution is not necessarily the easiest to implement. SVG provides an alternative graphics environment that may make animation a piece of cake in some situations. The scalable nature of SVG also provides obvious benefits over fixed-sized raster images. The reason we rarely see SVG used is that Internet Explorer (below version 9) has no support for it. But not all is lost! The Raphaël library that Get Satisfaction uses automatically substitutes SVG for VML (vector markup language), which IE can understand. The CSS transitions that we examined above can alter any number of properties to create a lot of visual effects, but ultimately they’re still limited to CSS styles and fixed-length transitions. Is there a way to create more advanced animations? 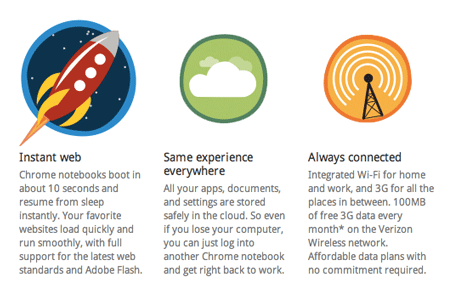 Chrome features: each icon animates on hover. Here we have an a link that contains a canvas element (which itself contains an image). For browsers that do not support canvas, the image serves as a fallback—who said supporting IE6 was hard! The individual SVG assets for the canvas animation. The downside? Google’s example isn’t very accessible, and the fact that the content in the canvas element is generated dynamically is a real issue. Search engines will have a hard time seeing your canvas content, and more importantly, assistive technology such as screen readers will struggle as well. If you want to display content with the canvas element, then providing the same content in an alternate and accessible format would be considerate. Canvas is probably best used to display more visual data such as graphs, charts and diagrams. These are situations in which the content can be isolated and presented in a way that’s easier to understand. Canvas, Accessibility and SVG Bruce Lawson discusses the accessibility of canvas. HTML5 Canvas Element Guide A beginner’s guide to the canvas element by Louis Lazaris. HTML5 Canvas Interactivity A guide to keyboard and mouse interactivity in canvas by Johnny Simpson. Saving the best for last (well, you never would have gotten this far if I’d put this first), we have the powerhouse that is Adobe Flash. Flash is not a Web standard, but it is used extensively across the Web. However, always weigh up arguments for and against Flash. You’d be amazed at what’s possible with modern standards. That said, despite the negative opinion of many Web designers and developers, Flash is still a commercially viable option. But this is becoming more and more debatable as standards progress. We’ve seen some great examples of what can be achieved with Web standards today. The CSS :hover pseudo-class and transition property can be combined to create a wide variety of hover effects. Images can be contained within inline SVG, providing a simple way to transform them beyond the limitations of HTML and CSS. These techniques can bring a website to life and enhance the user experience. But they also have the potential to make a website look like a hangover from the DHTML era. There’s no accounting for taste, so use it with care. Always focus on the accessibility of content and on user experience over eye-candy. The answer is yes… but it’s not that simple. Browsers such as Internet Explorer don’t support SVG, and Raphaël uses VML instead. Careful research is required before rolling your own solution. It may be more difficult than you initially suspect. There are libraries such as Modernizr in which individual functions can be isolated as required very easily, so that is always worth considering. With the new Modernizr beta preview, the situation has been recognized, and Modernizr now provides a completely custom library for your particular requirements.